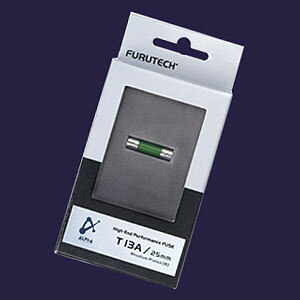 Furutech's TF series Audiophile grade fuses are fully non-magnetic Time-lag (slo-blo) available in two sizes: 20mm (small) and 32 mm (large). These fuses use specially designed, pure copper end caps with direct rhodium plating (no intermediate layer of nickel). The fuse's burn conductor is made with a special low induction copper alloy, and has a ceramic body with special damping filler. All metal parts treated with Furutech's patented Alpha Super Cryogenic and Demagnetizing process. These beautifully made audiophile fuses are engineered to withstand 1 nanosecond at a full 1500 watts! 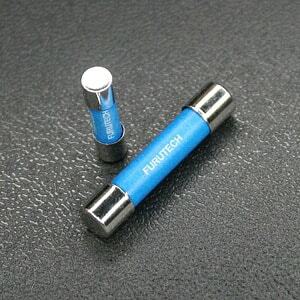 Furutech's T series fuse is made with similar construction as the TF series above, but uses a slo-blo pure silver conductor, rhodium plated contacts, and has been cryogenically treated and demagnetized by Furutech. Dimensions are 6.4mm X 25mm. Fits Furutech U.K. male AC connectors.